It has a month since my last post, so I feel I should put something on the blog to keep interest up. I was away with my wife on a great cycling trip in the south of France for 2 weeks. The soldiers were left on their own under the command of Général Tiff during that period of time; a few flags knocked off, a couple of bayonets bent and a lot of black fur on the terrain, all in all not too bad! I have also been terraining away with the great adjustment to unit size as documented in the last post, almost done thankfully. 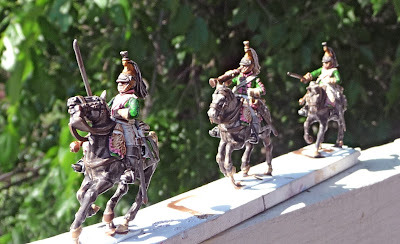 I have got in a bit of painting though since I got back and although I do not like to put unfinished units on my blog, there was not much else to report so I said why not. 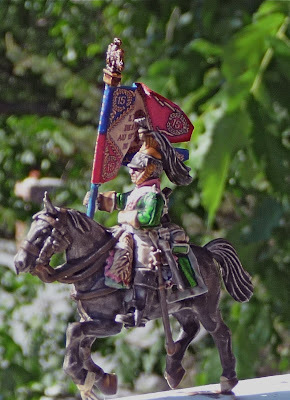 About a month ago I bought a box of the Perry Dragoons, and since every one has been going on about the Perry hard plastic cavalry, I thought I would have a look. Before I knew it they were glued together and primed so I said why not. Very easy assembly, nice figures for sure. Alas one sprue was missing from the box (the command/standard bearer one), but I decided to push on. Fortunately a very kind fellow gamer heard of my plight and will send me the missing sprue. They have been painted in the usual fashion with a white primer, thin stains, followed by a dose of Army Painter and a bit of Dullcote to take the shine off. It was a bright sunny day here in the suburbs of Boston, so I went outside and tried a bit of photography. The usual bad results I am afraid, I just could not get the wretched camera to auto focus and this time the snaps were overexposed. Just can not get these digital cameras to work. I took a sword arm and converted it to a standard bearer, I will change it out when I get the missing sprue. I am thinking about to start with these beautiful Perrys and Victrix figures some day! They've come up very well - the standard bearer in particular. Is that the standard that came with the box or another make? Whichever it is its very good. Well done. 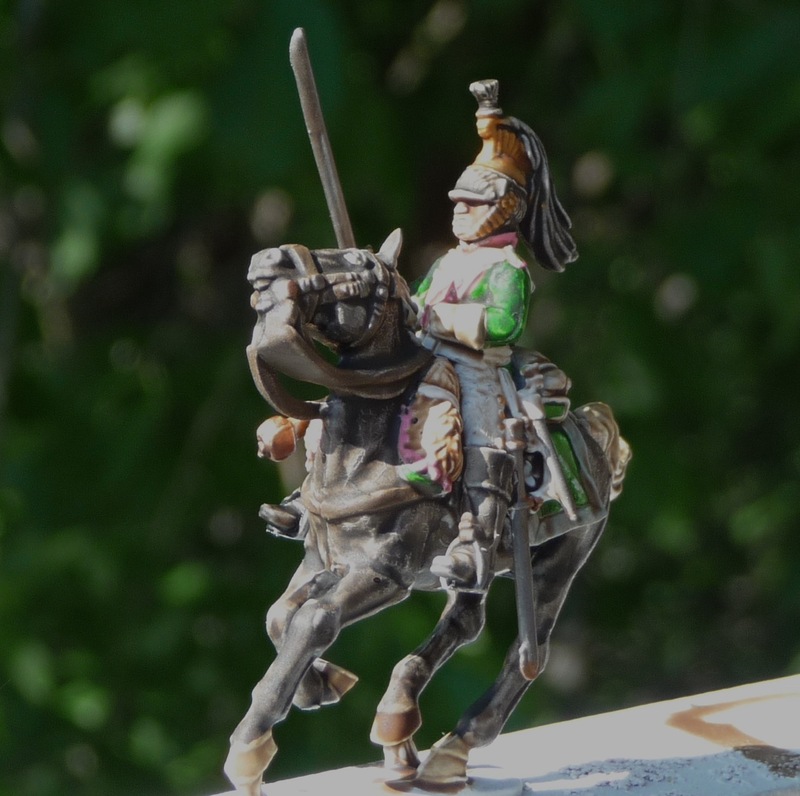 I am having the same problems with photographing figures! 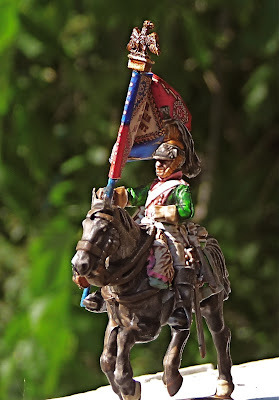 But the Dragoons look great. Hmmm...'General'? Tiff got a promotion?